The Pasadena Symphony and POPS is one of California's most respected ensembles and hold year-round performances at the Ambassador Auditorium and LA Arboretum. Their success is based on the perfect balance of talent, dedication to craft, and the application of advanced audio technologies that Complete Production Rentals (CPR) knows intimately. Dual 16-element VUE al-8 arrays on stage at the LA Arboretum with the Pasadena Symphony Based in nearby Westlake Village, CPR has been the symphony's exclusive audio provider for more than a decade, and CPR President and Founder Jack Haffamier's relationship with the group dates back even further. It's a long-standing collaboration based on trust, and strengthened through many years of mutual success. With such a solid foundation, Haffamier is understandably critical of any new audio technology that seeks a place with the ensemble. 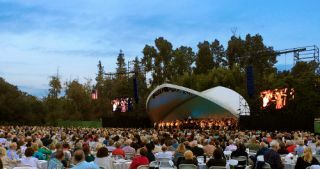 The Pasadena Symphony’s recent performance in the LA Arboretum welcomed CPR's first official and very successful deployment of a VUE al-8 Line Array System. "I first heard a selection of VUE speakers at a demo in Los Angeles late last year," explained Haffamier. "I was immediately impressed with their build quality and clarity-especially in the key vocal range. While I didn't get chance to hear the al-8 specifically on that day, I could tell that there was a very consistent and compelling 'family voice' across the line." In June, Haffamier invited the VUE team out to evaluate the symphony's needs and produce an EASE model of the venue. Dual 16-element al-8 arrays with additional near field coverage provided by four al-4 elements suspended below utilizing VUE's unique transition bar"I was very interested in testing the al-8 in real-world conditions," he said. "The LA Arboretum can be a challenging venue, and I was particularly concerned about getting adequate low- and mid-frequency coverage out to 280 feet." The final design included dual al-8 arrays consisting of 16 elements per side. Additional near field coverage was delivered by four al-4 line array elements suspended below each al-8 array with VUE's al-8-ufb "combo array" transition bar. A total of eight VUE V6 Systems Engines provided power and processing for the al-8 arrays, while a pair of V4 Systems Engines handled the smaller al-4 elements. "Even with unexpected delays, I was impressed at how quick the al-8 was to fly," explained Haffamier. "We had a relatively short setup window, and to further complicate things, upon arrival we discovered that our Condor boom had been borrowed by a local film crew. Once the boom was retrieved, the al-8's simple rigging and compact size allowed us to fly and aim the system with time to spare." With assembly complete, Haffamier, along with Technical Directors Larry Estrin and Greg Burns, began the process of tuning the VUE array in preparation for Greg's final "golden ears" test later that afternoon. "The al-8 sounded fantastic from the moment we sent signal to it," Haffamier explained. "With very minimal tweaking, the imaging was set and the coverage was 'spot on'-even at the 280-foot mark were the low frequency directivity in many line array systems simply breaks down".